Balut is a boiled, fertilized duck egg and is popular food in parts of Southeast Asia. 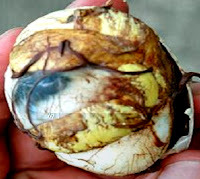 Popularly believed to be an aphrodisiac and considered rich in protein, hearty snack, balut is commonly sold as street food in the Philippines. They are typically sold by street vendors at night, out of buckets with cloth to keep it warm. I bet you know why it's usually sold at night. An alternative is Penoy, an infertile incubated duck egg or with dead embryo also boiled for about 20 to 30 minutes. These two are usually sold together. 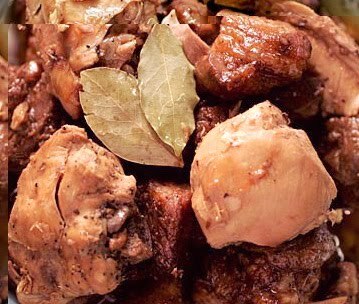 Adobo is the name of a popular dish and cooking process in Philippine cuisine that involves meat (usually pork or chicken) or seafood marinated in a sauce of vinegar, soy sauce and garlic, browned in oil, and simmered in the marinade. Taste and other ingredients may vary from different Islands. Some may put other vegetables like potatoes. Although it has a name taken from the Spanish, the cooking method is indigenous to the Philippines.It is a very popular dish and you can easily find it in any Filipino restaurants. Sisig is a popular appetizer turned main dish that originated from the culinary capital of the Philippines : Pampanga. This dish was invented by Lucia Cunanan, popularly know as Aling Lucing. Originally, sisig is composed of chopped pigs face (snout included) and ears with a generous amounts of chicken liver. Today, hundreds of sisig variations are available ranging from the original pig's face ingredient to a more healthy seafood concoction such as squid, tuna, milk fish, and mussels. This is best served with beer. 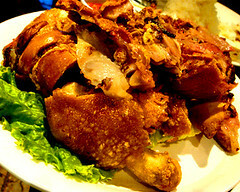 Crispy Pata is a famous Filipino pork dish that uses a whole pig’s leg. The leg (or pata) is made tender by simmering in water along with other spices. It is then rubbed with seasonings and deep-fried until the texture becomes very crunchy. This dish can be eaten as a main dish along with pickled green papaya and a dipping sauce made from soy sauce, vinegar, brown sugar, and chopped onions. This is also best served with beer. 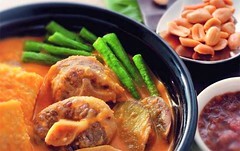 Kare-Kare is a traditional Filipino stew complimented with a thick savory peanut sauce. The commonly used meats for this dish are ox tail, tripe, and pork leg; on some occasions goat and chicken meat are also used. Besides the peanuts, this dish depends on the shrimp paste (on the side) in order to be fully enjoyed. Traditionally, clay cooking pot is used to cook this dish and it is also used as the serving pot. Suman is a traditional Filipino rice cake that is usually made from glutinous rice cooked in coconut milk and steamed in banana leaves. Aside from using glutinous rice, some variations also use root crops such as cassava. There are numerous varieties of suman, with almost every town or locality having its specialty. 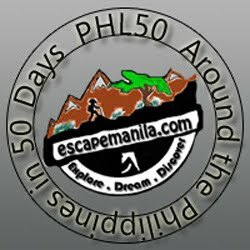 Is is also popularly called "budbud" in the Visayan and Mindanao region. 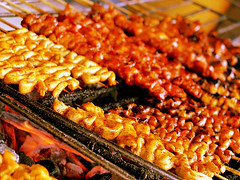 Grilled Isaw is chicken or pig’s intestine boiled until tender then grilled. This is probably the most sought and most popular street food in the Philippines. This food goes well with beer or liquor and has earned the reputation of being the best affordable appetizer. 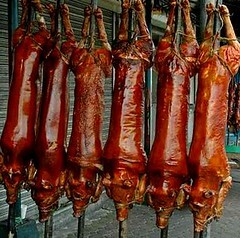 Cebu's version of the famous lechon is considered by most as the tastiest and crispiest, with such flavorful meat that condiments or sauce are typically not necessary anymore. 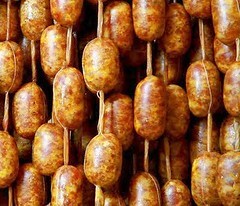 Longganisa (or longaniza) are Filipino chorizos. These cured sausages are famous in almost every Philippine region. The famous varieties of longganisa are : Vigan , Lucban, and Guagua which were named according to the town that they came from. Pork is the most common meat used in making this sausage; Chicken, beef, and even tuna are sometimes used as alternatives. Longganisa's from different regions may tastes slightly or totally different, so better try the longganisa for breakfast wherever you are in the Philippines. Pinakbet or pakbet is a popular vegetable dish that originated from one of the northern provinces of the Philippines, Ilocos. The vegetables used on this dish are usually grown in the backyard of every villager and are available almost all year long. Bitter Melon, eggplant, okra, and string beans are just some of the vegetables that make-up this delightful dish. Pakbet is cooked in a clay pot called “Palayok” and Anchovy sauce is used to add flavor. As the fame of this dish grew, several versions have sprouted. In Manila and other cities, Pakbet is cooked with squash (pumpkin) and shrimp paste is used to give flavor to the dish. So there you go, let your palate be satisfied with these tasty Filipino delicacies. Though, I would not be surprised if you won't try Balut, I myself is not a fan of it. Enjoy your meal | Bon appetit| Selamat makan | Buon appetito | Douzo meshiagare | Guten Appetit! Mahlzeit! | Jal meokkesseumnida ... and let me know your experience. Thanks for dropping by. I have fixed the typos. Please let me know if you still find something to fix.